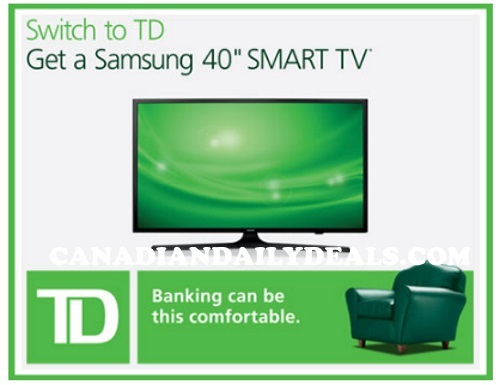 TD Canada Trust has a great freebie offer for new customers right now! Get a Free Samsung TV if you apply for a new chequing account and credit card. There are two Samsung TVs eligible for this offer, either the Samsung 28' LED H4000 Series TV or a Samsung 40" LED I5200 Series Smart TV. Which one you get depends on what accounts you choose to apply for and if you meet the criteriaa. To get the Free 28" Samsung TV: Open a TD All-Inclusive or Unlimited Chequing Account, Set up and complete one direct deposit Complete one pre-authorized transaction of $50.00 or more, Pay one bill (minimum $50.00) online. Pay one bill (minimum $50.00) online, Apply for a TD Visa Credit Card and spend $500.00 with the card before October 17, 2016. This offer is available for a limited time only to new TD customers, that meet the criteria before October 17 2016.